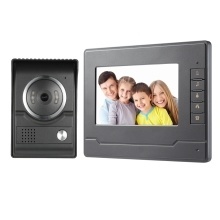 *7" wired video intercom video door phone doorbell intercom system for home apartment,low power consumption,high-definition widescreen images. *Support monitoring,intercom,unlock,hands-free,ring tones selection function. *25 kinds of chords optional,not always hear the monotonous doorbell,ring tones volume can be adjusted. *700TVL CMOS sensor,clearer pictures displaying.6pcs high-intensity IR LEDs for good night vision effect. *Outdoor camera with super rainproof material,wall-mounted installation is simple and convenient. *The indoor unit has the monitor function,you can monitor the outdoor scene at any time.It is an ideal home security product which will make for a safer home environment.